The speed with which the #FUNDtheSUIT campaign has surpassed its goal has simply astonished me. I am so proud to see how many companies, stores, state associations and individuals came through to keep the lawsuit going. With that said, since we have exceeded our $250,000 goal, it's time to call the GoFundMe portion to a close. There are sooo many people to thank for their hard work on this — my team here at VAPE News for all of their efforts, Fig Ramsey for more than I can put into words, Grimm Green, The Vaping Bogan, R2BSF, Huy Nguyen and Naked 100, Innokin, Drip More and so many others. I sincerely apologize if I've forgotten to list anyone. I know many stores and companies are still running promotions for this, and there is still a place for your help. Moving forward, this fight continues. As we said in the beginning, the goal was a conservative estimate. In addition, there are other active cases as we speak. The more of these in which the industry can intervene the better. For anyone who still wishes to contribute to the lawsuit effort, we at VAPE News ask that you visit the Right to be Smoke Free Coalition website and donate directly by clicking here. Again, we want to thank everyone who gave — from the smallest donation to the largest, YOUR contribution counts and WILL make a difference. At just a few hours past the one week mark, the #FUNDtheSUIT campaign hit it’s goal of $250,000. It crossed the line with a mid-evening $62,000 donation from Candy King/Drip More who asked to “pay whatever was left.” Today’s donations alone total in excess of $103,000. Three donations: Candy King, Naked 100 and Innokin Technology — Sevia USA totaled a combined $132,000, or 53% of the total needed. Thanks to the outstanding generosity of the industry, it’s businesses, and even its consumers, we hit the goal in a small fraction of the time we expected to need. Knowing that many business were running promotions for the fundraiser, we will be keeping it active for the near future. In short, we are amazed. 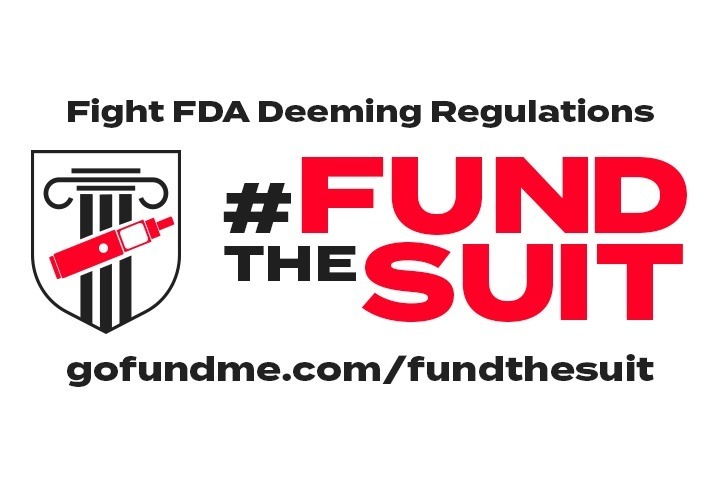 The sole purpose of #FUNDtheSUIT is to ensure that the pending lawsuit in defense of vapor products (Nicopure and Right to be Smoke Free vs FDA) will be able to continue through. Thanks to nearly 1,000 individuals, shop owners and manufacturers, that will be able to happen. For more information on the lawsuit and it’s current status, click here. Below, I would like to acknowledge many of those who have made substantial donations to #FUNDtheSUIT . Donations come in all sizes (900 of them so far), and every single dollar is appreciated. Whether you donate $50,000 or $5, this suit is not possible with YOU. Soon we can get back to why we’re really here…to save lives. Eds. Note: This list and page will be updated throughout and after the campaign. We all know “the suit” — Nicopure and Right to be Smoke-Free vs. FDA. It’s one of many facets of the ongoing war to save vaping. But right now, it’s a struggle, and one of our lasts hopes. After an ugly, but not totally unexpected, decision in favor of FDA in July 2017 at the district court level, the plaintiffs have moved the case on to the appellate court. You can read about the appeal here. Without a substantial win at this level, the case could move on to the U.S. Supreme Court. This is where the difficulty arises. Federal lawsuits are not cheap. Federal lawsuits against government entities get even more expensive. And right now, the money is drying up. The outstanding bill for this suit is rising by the day as the fight continues. In order to pay for the hard work done so far, and to see the appeal all the way through – possibly to the Supreme Court – will conservatively cost $250,000 in legal fees, time, filings, preparations and a variety of other items. We, as an industry, cannot afford to let this lawsuit slip through the cracks. So today we come to you asking for help. We at VAPE News Magazine/VAPENews.com have partnered with Grimm Green and others to organize this grassroots-style fundraiser to help keep this moving forward. We are asking the businesses in this industry – manufacturers, distributors and retailers –to step up to the plate. This is YOUR industry that is on the line, and we need YOU to take the lead funding this lawsuit. With that said, this is not your average fundraiser. ALL funds donated are being routed directly to one issue — the Right To Be Smoke Free litigation fund, with the exception of a 3% and .30-cent per transaction GoFundMe fee. THERE ARE NO MIDDLEMEN. ALL money collected will be used to fund the lawsuit. What you give goes DIRECTLY to ensuring that the lawsuit can continue. MANUFACTURERS: First, donate! This lawsuit will directly impact you and your ability to continue to do business. We have included in the linked graphics folders are leaflets, and other items that could be included in your outgoing orders. Any way possible you can help is greatly appreciated. Again, in the end it comes down to dollars and no donation is too small. SHOPOWNERS: Please contribute! We need vape shop owners around the country to unite! We are also working with Saffire Vapor to create a comprehensive package that can be used to promote the suit in your store. Any way you can give and help spread the word is appreciated. CONSUMERS: We simply ask that you share this link with the larger companies that you patronize. Please share it on their social media accounts, by email, or even a quick call. Also, consider sharing with the shops you do business with and ask them to forward to their suppliers. Of course, if you would like to donate as well, we sincerely thank you for any amount you can give! Please share this EVERYWHERE — and OFTEN. If you can give (no matter the amount), we sincerely thank you. Linked here is a Google Drive folder containing images of ALL sizes relating to this fundraiser. Use in any way you see fit. We need them placed on websites, social media feeds, emails, posters, banners, rotating on televisions in your stores. Click here to download. Thank you in advance for your time and donations. Let’s fight. And let’s WIN this thing. * DISCLAIMER: Contributions to the lawsuit are not tax deductible. Now officially one week into the #FUNDtheSUIT campaign, a total of 63 percent of the goal has been raised — $156,311 of the $250,000 goal. Thanks to the outstanding generosity of the industry, it’s businesses, and even its consumers, we expect to hit the goal. The sole purpose of #FUNDtheSUIT is to ensure that the pending lawsuit in defense of vapor products (Nicopure and Right to be Smoke Free vs FDA) will be able to continue through. Below, I would like to acknowledge many of those who have made substantial donations to #FUNDtheSUIT. Donations come in all sizes (900 of them so far), and every single dollar is appreciated. Whether you donate $50,000 or $5, this suit is not possible with YOU. Let’s stay positive, push forward and hit this goal. That way we can get back to why we’re really here...to save lives. Eds. Note: This list will be updated throughout the day.